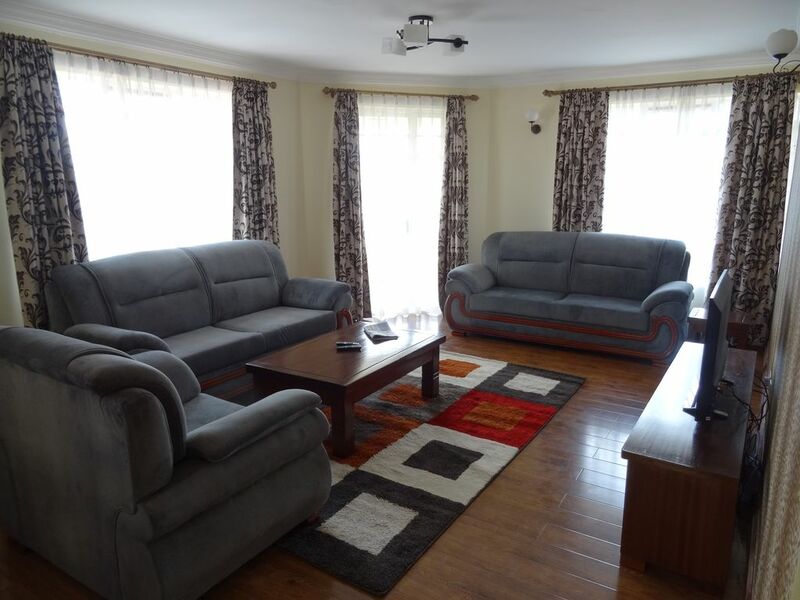 This Apartment is located at Thompson Estate which is part of Lavington Naiorbi, approx. 1 km from Ngong Road. A newly built 2 Bedroom fully furnished Penthouse Apartment located in a Quiet prime area in Lavington (Hatheru Rd) Nairobi. Close to Junction mall and Valley Arcade. 15 minute drive to CBD. Minimum rental period 1 week. •1 Master bedroom (Ensuite) with Jacuzzi and separate shower). •A fully equipped kitchen with a Big cooking stove, Fridge, microwave , Toaster dishes and cutlery. •Separate dining area with sitting capacity of 8 people. •2 balconies with HIGHER Gitters for extra Security (one has Laundry area with a washing machine and a drying cloth line under a nice pergola). The Apartment is located on the 7th floor of the building and it offers an excellent view plus a catch of fresh air while relaxing on the southern Balcony. Gitters at the main door for EXTRA Security. I am originally from Germany, graduate in Business and Public Administration, my wife is Kenyan and a civil engineer. We bought this place in 2016 and still upgrade it whenever we are there. Nice and secure area. This is our private Apartment, hence we are taking a great care of it. Very nice apartment with nice view on Ngong hills. Tastefully furnished with fully equipped kitchen. Cleaning service available twice a week at no additional cost. Internet and Sat TV, elevator, jacuuzi in Master bathroom. Recommended. Would stay there again. There is a building site close by so sometimes you can hear workers during the day. I was informed construction is completed end 2018. But not disturbing at all. Very nice place. There is still some slight finnishing going on at the outside but it did not disturb me at all. The location is very secure in a high end area of Nairobi. The Apartment is very spacious and lovely furnished. There is a Dining area allowing space for 8 People and a sitting area for 6-7 People. The Master bedroom is very nice and spacious with a big double bed and mosquito nets. The second bedroom is small with 2 single beds but for sleeping sufficient. There is a water dispenser and I highly recommend tenants to organise bottled water (20 Liter 600 ksh which is like 4,50 Euro or 5 USD). No Need to say that in Kenya you should not drink pipe water. On this property it is from a borehole. The kitchen is FULLY equipped and if I say fully, I mean there is nothing I wouls ask for in addition. Pan, cooking pots, cutlery, plates for like 10 people, cups, glasses, microwave, oven, just everything you would expect, just like in Europe. Some of the stuff is even brought from Europe (Quality). There is a washing machine and possibility to hang the cloth on the rear balcony. The place offers Wifi for free and cable TV with like 50 channels or so. For us it was absolutely sufficient as we are not the „TV watching“ people. After all, we stayed with our 7 year olf daughter and enjoyed our stay. We had 1 or 2 short power outages lasting less then an hour each while there but it was OK and nothing dramatic, This is Africa…. While we were there the pool was not yet finnished but we were told it should be completed by early/mid 2018. Big plus: The landlord was very responsive via WhatsApp and responded to questions, queries within a very short period of time.